Conducted against the background of five ideal ombudsman models, this penetrating analysis of the European Ombudsman questions the fitness of this relatively new Community body, as currently constituted, to the activities of the Community authorities it is expected to supervise. The European Ombudsman is based on the Danish ombudsman plan, a `redress' model designed to offer and facilitate alternative dispute resolution. Given the type of activities the Community performs, the author of this important study asks – is a redress ombudsman in fact what the Community needs? European Ombudsman: Redress and Control at Union Level demonstrates that the Community-level issues addressed by the Ombudsman are primarily in the area of control, i.e., directed towards general supervision instead of dispute settlement in individual cases. more regulation and supervision of the Committees involved in rule-making. A new ombudsman based on the models the author describes would, she shows, ultimately provide the greatest benefit to the Union and its citizens. 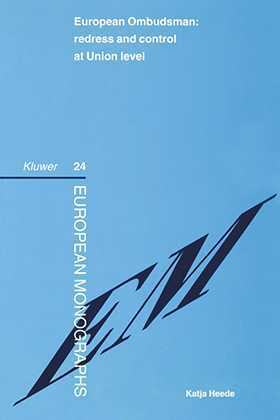 This book will be of inestimable value to policymakers, lawyers, and academics, in Europe and elsewhere, as a reasoned and enlightened study of the best use of a highly promising emerging institution of governance.